So we finally have a website! like a proper fancy one?? So bookmarked the link and follow us there for updates on guests and all other informations! so we just updated our facebook! do check out our facebook page for more and don’t hesitate to contact us for an appointment today!!!!! People always have this concept that people with tattoos are crazy, dangerous, criminals, drug addicts and all the negative traits..
Well to be honest, we’re not crazy! we just know how to have fun! We too try to give our kids the best and we love them as much as any normal looking parents too. Did i mentioned that our studio is children friendly??? so don’t let our appearances fool you! we can be the nicer than most of the people you meet with no tattoos. On another note, you can get a yourself a Galaxy Tattoo Tee for SGD40 for (S,M,L) and SGD45 for (XL, XXL).. Altering service avaliable for SGD5! Yup you can actually get them for your little ones too! So Come and get one or more for yourself and love ones now!!!! So here’s our first baby of Betrayal clothings!!!! How can you not love this? It’s got best of the both worlds, cat and skull!!! The boss man is wearing M and Jaroslaw is wearing L.
Avaliable in 2 colours (dark grey and grayish white) and 5 sizes – S, M, L (SGD40) , XL, XXL (SGD45)!!! Swing by the studio today to get yours!!! Dont worry if you’re not based in Singapore, We do international shipping too!!! We’ll be doing a $150 palm size tattoo promo on the last week of May ‘ 15 (25th to 30th)!! Swing by the studio anytime after 12pm on those days to get something you want (palm size) for just $150! Our artists will also have some flash for you folks to choose from too!!! Stay tune for more updates!!! First come first serve basis. Spread the love and share this lovely information with your friends!!! 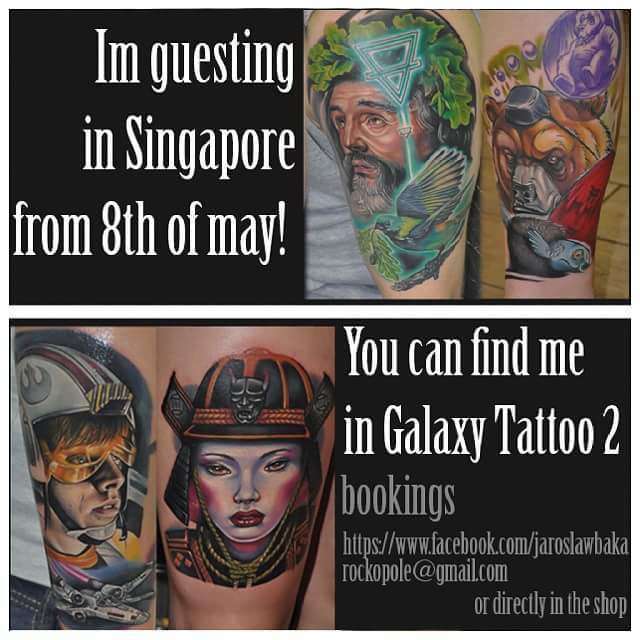 We’re really happy to have Jaroslaw back again at our studio this coming may!! If you guys missed your chance the last time to get something done by him, don’t hesitate to contact us or the man himself for appointments!!! He’s the man to go to if you wanna get some awesome colour realistic tattoos!!!! In god we trust, all others have to pay a $50 to $100 non refundable deposit for appointments and sketch.